One of my favorite things about living in Florida is the daily parade of exotic creatures that cross my path. 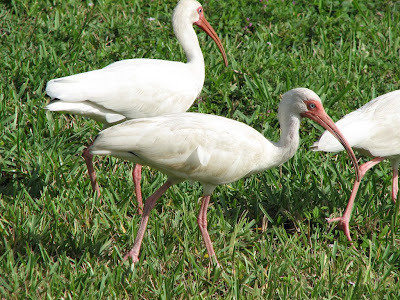 I live a pretty urban existence, but it's not at all an unusual thing to have a small flock of white ibises get out of my way as I walk to the car in the morning. As the white ibises feign their mute alarm (the things are unflappable I swear) the monk parrots in the date palm across the street make a racket that more than compensates the ibises' silence. I love that scene and I love the very routine-ness of these encounters. The creatures I come across less frequently are an even bigger thrill. Out of all of the curiosities I've encountered in the last (almost) 20 years, my all time favorite has to be Nephila clavipes. 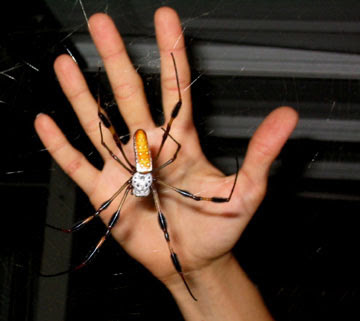 Nephila clavipes is Florida's yellow silk spider, variously known as a banana spider, a calico spider, a writing spider, a giant wood spider or a golden orb spider. Whatever you call it, N. clavipes is hard to miss. As some of their names suggest, N. clavipes spins an orb web of unusual color. It's a rich, golden yellow and it has to be the strongest spider silk I've ever come across. If you see one of these webs in the woods, you can pluck the support filaments as if they were guitar or harp strings. They don't make any noise of course, but those web filaments feel every bit as strong as the strings in an instrument. The spiders themselves are harmless to humans, though they are a bit intimidating. Ever since I first stumbled upon one during my first summer in Florida, they have cast a spell over me I can't quite explain. There's a lot of information out there on them and this tells me I'm not the only one who's fascinated by these beauties. 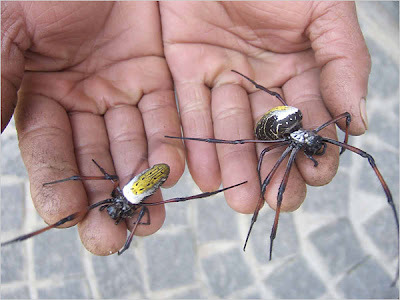 There are Nephila species located all around the warmer parts of the world and the New York Times broke a story this week about some clever soul in Madagascar who took his fascination with Nephila further than anyone else ever has. The American Museum of Natural History in New York this week unveiled the world's only brocaded textile woven from spider silk. Simon Peers is an art historian, textile expert and 20-year Madagascar resident. He joined forces with Nicholas Godley, an American fashion designer and fellow Madagascar resident, to recreate and perfect what had been tried and abandoned for as long as there have been human beings around to admire spiders. They were going to make a fabric from spider's silk. It had been tried before in Madagascar, so their idea wasn't without precedent. 100 years ago, a French priest, inventor and educator known as Father Comboué figured out a way to spin spider silk harvested directly from the business end of a Nephila inaurata into a thread. He was said to have made enough of this spider's silk fabric to outfit a bed canopy. Reports differ about how true that story is, and whatever fabric he did create no longer exists. So from the attempts of Father Comboué until Peers and Godley waded back into the spider silk business five years ago, no one had successfully made anything from spider silk. Peers and Godley perfected earlier attempts through their persistence and tenacity as much as anything. The fabric unveiled this week required the output of a million spiders. With the help of the Malagasy people, Peers and Godley collected upwards of three thousand N. inaurata a day. They would place each spider in a harness and then connect it to the harnesses of 23 other spiders. The 24 spiders would spin a single filament each and the filaments would be wound into a thread and then onto a spool. Each spider could produce a single filament 400 feet long before it could produce no more. Once spent, the spider would be re-released to the wild where it would regain its strength in a day or two and could be recaptured and "milked" again or go about its life. Once they had enough thread, they could in turn spin that into a yarn and start weaving. 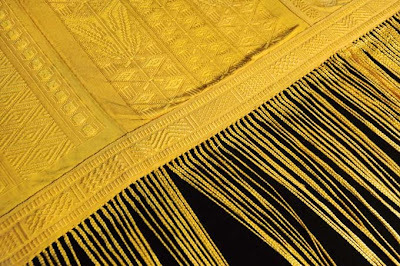 Madagascar was once known for its intricately woven textiles. Peers and Godley wanted to revive the dying art of Malagasy textiles and to teach a new generation about the weaving traditions of their ancestors. 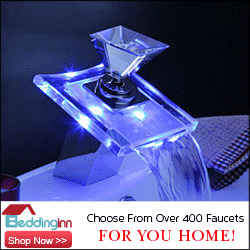 They chose a traditional brocaded pattern once reserved for kings for their project and commenced weaving. The men estimate that it cost a half a million dollars to produce an eleven foot long shawl, which they regard as a work of art more than an economically viable textile. 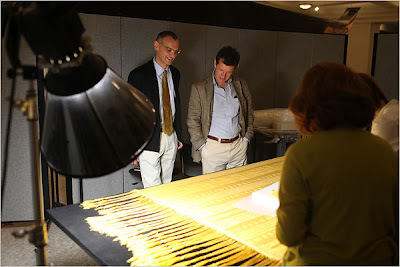 Whatever it is, what they produced is the first example of a brocaded fabric hand woven from spider silk ever recorded. It's an quite an achievement. The color is the natural, yellow gold of the Nephila species and it's said to be as strong as if it were woven from Kevlar. Needless to say, I'm captivated by this story and it has me looking at my beloved yellow silk spiders in a whole new light. I found this video yesterday that was shot at the unveiling and it features Peers and Godley describing their work. If you're in New York, head up to the museum at 79th and Central Park West and let me know how it looks in real life. This is just cool. or the slower tai-chi arm movement to ward off webs. What I love most about this new textile, other than that it now exists, is how many questions it raises. 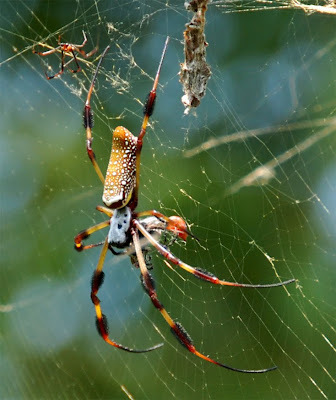 What do Golden Orb spiders eat- other than each other? What does a "Harness" for a spider look like? 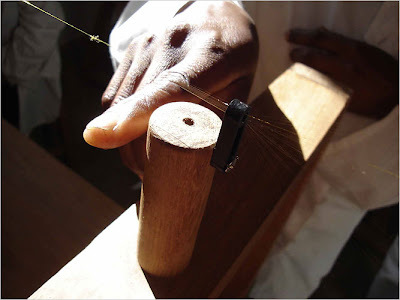 Will this help revive Madagascar textile arts? The textile is high Craft by its making, but high Art by the number of questions it raises to think about. I'm glad to see that my imagination's not the only one that's been lit up by this unveiling. I would love to see that harness set up almost as much as I want to fly to New York this weekend to see the finished product. One of the many fascinating aspects to this is that the raw material production requires the cooperation of a living (and large) spider. Silkworm silk requires the death of a caterpillar, but spider silk is a living resource that has to be kept alive and happy. That alone has had me musing for days. If you read around about Peers' life work, he's committed to preserving Malagasy weaving and more importantly, involving the Malagasy people in this renaissance. What a story! I can't even imagine what that fabric must feel like. I visited my brother one time in Dothan Alabama and we went exploring in a nearby swamp. The sun was going down and we came upon probably a hundred banana spiders in a stand of trees, each with a large web. The sunlight filtered through the webs and it was just stunning. That was in my pre-photography days, unfortuntely. I too saw this story and what I think is absolutely amazing is the natural color -- it is such an amazing shade of yellow, and one that was dictated by nature, not humans. They are stunning aren't they. That goldenrod-colored silk is as unexpected as it is beautiful. Can you believe that those spiders can actually change the intensity of that color to match their surroundings? In a dark hollow, the silk is brighter, and in full sun it's a less intense color. They are amazing creatures. I think the color amazes me as much as the process or any other single aspect of this thing. I wish I were in New York this week rather than two weeks ago. Oh well, I guess I have to go back. Damn. The process of milking the spiders for their silk really intrigues me... The idea of putting a harnass on one (wonder what it looks like) and getting them to release all their product --in fact a bunch of them at once-- paints an interesting picture in my head (akin to hurding cats!). My mind has been reeling for a week, I need to know more about this! 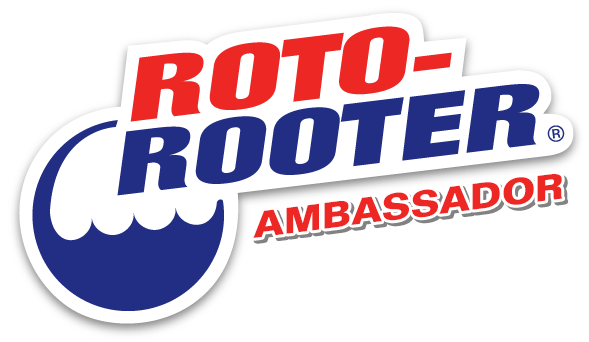 Thanks Paula and welcome to K&RD! I think I have one in my backyard in Lakeland Fl. My husband is very fearful of spiders and wants it gone. I am not sure what to do. Yellow Silk Spiders are common all over Florida. They are harmless to humans and they eat many, many insects. They are beautiful creatures and one of the many things that make me happy to be a Floridian. I actually moved to Florida a few weeks ago, and found this spider sitting outside of my CVS in a 6 foot tall web. Really crazy looking to my New Jersey-dimmed view of wildlife.